Wolves - Darren Shan Wiki - The wiki about all Darren Shan books! Wolves are a type of dog. They are considered friendly to Vampires. Darren becomes friends with a few on the way up to Vampire Mountain and they even saved his life from a rabid bear. 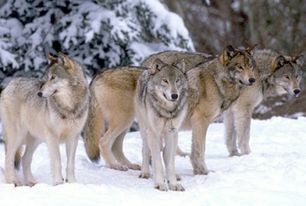 Later, when Darren ends up getting washed away in the river, he meets the same wolves in a bigger pack. They let him join the pack to gain strength before they lead Darren up to Vampire Mountain again. Here, some fight off rogue Vampires and help fight the Vampaneze. There is a myth that a Vampire went searching for Mr. Tiny to find out why Vampires can not bear children. Mr. Tiny takes a sample of his blood and uses it to impregnate a female wolf who had four babies. Two wolves and two human-like creatures of magic. These were Evanna and Hibernius Tall. This page was last edited on 20 February 2012, at 01:26.